I suppose there are gardeners out there who are completely satisfied with their gardens and have no plans for changes, expansions or wholesale overhaul, but not me. 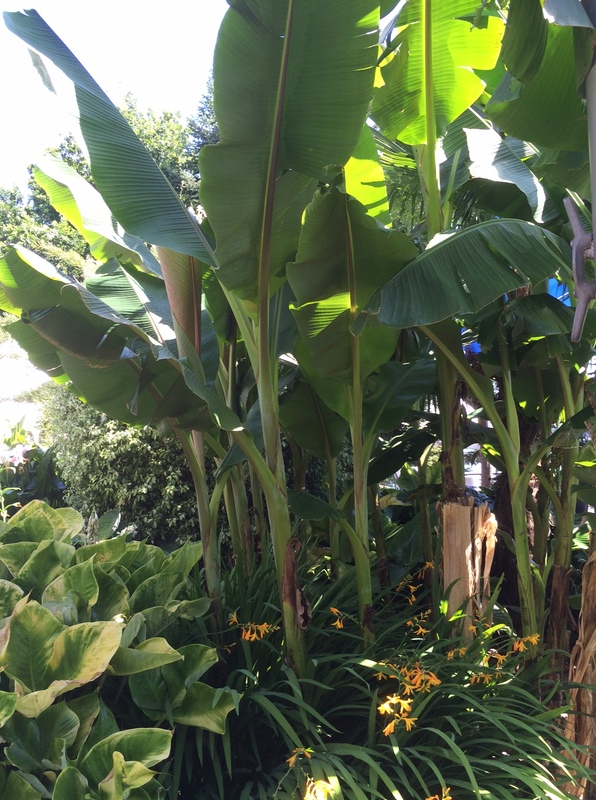 Musa basjoo was my first Banana plant. I grew it for several years. It is still widely grown in our region. There’s nothing wrong with it, but I removed mine and replaced it with Musa sikkimensis, the plant pictured above. In my opinion the foliage, and the way it is carried on the plant, is superior to M. basjoo. First, is the more vertical angle that it holds its leaves. This shows off the underside of the leaves and lets morning or afternoon sun light illuminate the leaves causing them to ‘glow’. The red mid-rib of the leaves really stand out! In M. basjoo, this doesn’t happen because they’re held in a nearly flat position. M. basjoo also lacks the red mid-rib. 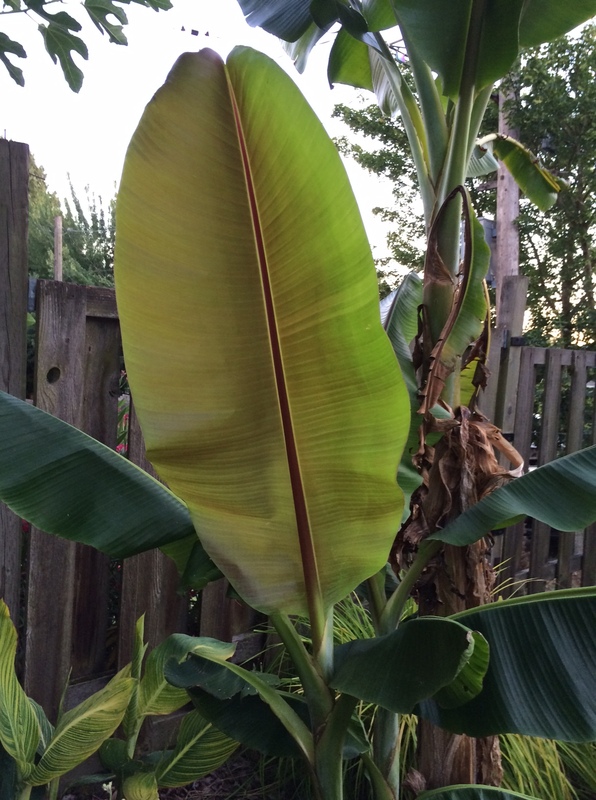 Next, and this is my opinion from having watched these plants over a period of years, is that M. sikkimensis allows its leaves to ‘flutter in a breeze lettting it ‘spill’ more wind preventing some of the shredding that can afflict Bananas on windy sites, something like the larger Ensete does. So, why am I preparing to remove it now and swap it out? Was there anything lost in the swap? M. basjoo may have a slight cold hardiness advantage, but its minimal. M. sikkimensis is a little slower to start growth in spring. Both may be wrapped with mylar backed bubble wrap to help protect the stems. Neither requires mulch to protect the rhizome in Portland winters. Both come through without problem. Just remember to keep your shovel and spade away from them in the fall. New wounds can make them susceptible to fungal rot and death. If you want to divide or reduce Musa spp. do it during the growing season. I know that seems counter-intuitive for us temperate region gardeners, but please restrain your shovel! M. basjoo, in my experience is also a slightly larger growing plant, but having said that, check out the M. sikkimensis I planted a few years ago in the display planter on the river side of our downtown Riverplace Hotel. While it was cut back this year you can see that it is growing it rhizome spreading. Musa sikkimensis by the Riverplace Hotel showing regrowth after being cut down. For those of you who don’t know, Musa basjoo is common to the Rykuyu Islands that trail off south of Japan and include the Island of Okinawa. I have friends who have lived there and say it is common and can form vast thickets. It was traditionalyl harvested for its fibers which were used for a traditional rough cloth. It is not ever eaten as its fruit are heavily seeded. Musa sikkimensis is native to the northern Indian state of Sikkim, pushing up into the Himalaya mountains where it can be found up to 6,000′ elevation. This one isn’t eaten either. 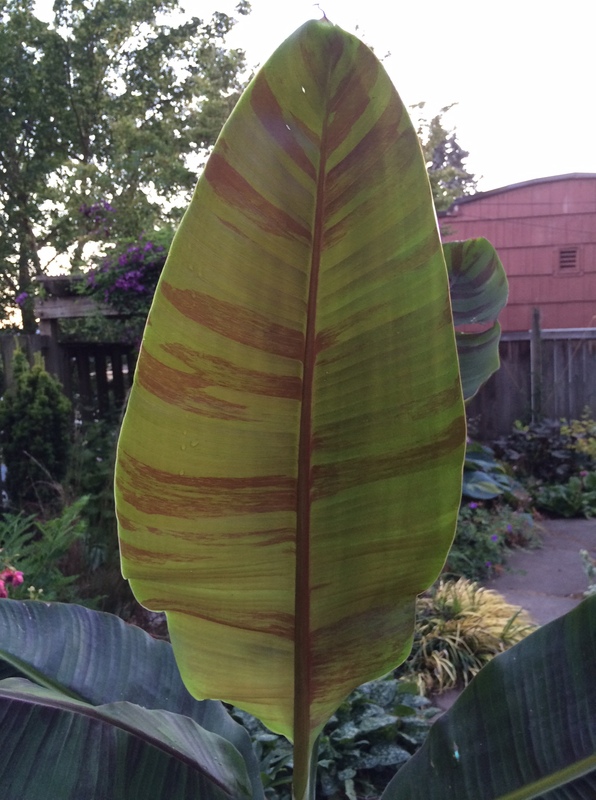 Musa sikkimensis ‘Red Tiger’ showing the red variegation between veins. M. s. ‘Red Tiger’ is a nice selection that seems to have the same hardiness as the available species. The advantage, obviously, are the splashes of ‘red’ between some of the veins, to my eye, an attractive addition. The site requirements for all three of these are pretty much the same rich moist soil with full sun. In practice here in Portland that tolerate relatively heavy dense soil, but of course do better with lighter better draining soil. The looser soil will also be advantageous when you need to dig and reduce the inevitable spread of the rhizome, which you will have to do more regularly. So, it’s kind of a wash. Steady moisture is a requirement especially in a hot spot to keep the leaves from burning, a must if you are growing this for its architecture and size. With our normally dry summers this means irrigation is needed. Treat it as you would a vegetable plant. I don’t need a huge, over 15′, plant so I don’t coddle it, in fact that would be out of scale in this spot in my garden. I do want it to look good, however. I don’t see this project proceeding until early next summer, ’16, because much of the larger bed needs reworking as I’ve had several failures and replanted too casually…I’m not pleased with the overall effect. There is also the problem of a cedar fence that is 27 years old and falling apart. We haven’t agreed on a solution that we both like, and can afford, it’s a 120′ of fence. So, I have more planning time and my M.s. ‘Red Tiger’ has time to grow on in its pot which is proving to be a little bit of a challenge in this hotter than normal summer. For those lusting after their own, I found my M.s. ‘Red Tiger’ at Rare Plant Research. 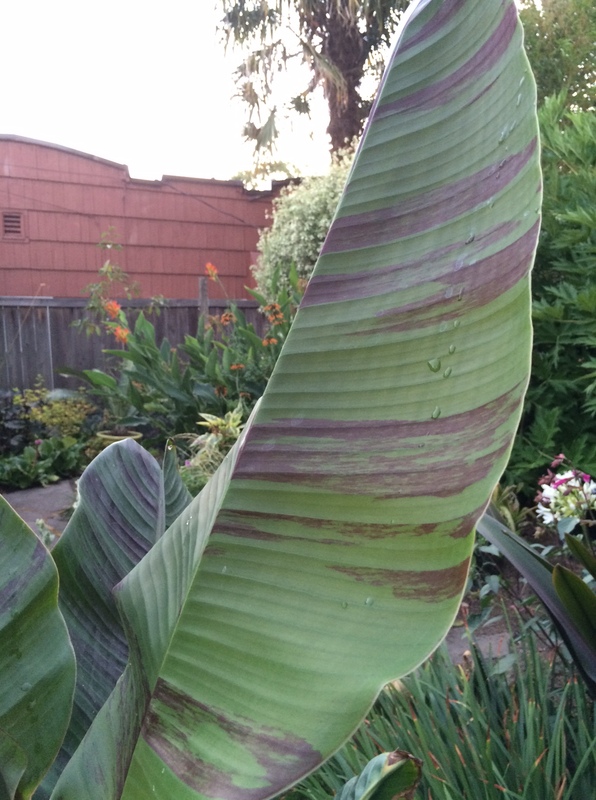 This entry was posted in My Garden and tagged Hardy Musa species on July 1, 2015 by gardenriots.